A Missouri federal district court judge has ordered a Medtronic bone graft lawsuit back to state court. The case stems from an off-label spinal fusion procedure. Plaintiff sued Medtronic and his surgeon claiming that Infuse bone graft was used in a manner that had not been approved by the U.S. Food and Drug Administration, and was therefore an unauthorized off-label use. Originally filed in state court, Medtronic had the case transferred from state court to federal court, claiming that the surgeon, a Missouri resident, was fraudulently joined In the course of litigation. As I wrote last week in another context, the drug and medical device companies see the joinder of any in state defendant as fraudulent. In this case, Plaintiff alleged fraud, medical malpractice and failure to obtain informed consent against the surgeon. Medtronic argued that the doctor was fraudulently joined because some of the causes of action against him contradicted accusations made against Medtronic. The judge, in response, determined that the possibility that a state court will incorrectly resolve a state claim is not, in itself, enough to trigger jurisdiction in the federal court. Medtronic Infuse bone graft has recently been linked to cancer, just the latest in surmounting concerns with Medtronic that include male sterility and ectopic bone growth. Amongst others accusations, Plaintiffs are filing suit claiming design defect, strict products liability, failure to warn, and negligence. Lastly, this “off-label” use lawsuit is not the first of its kind. There is a growing number of lawsuits filed against Medtronic alleging that they have repeatedly ignored the FDA’s warning against the promotion of off-label uses of the product. Evidence has been discovered that the company provided “kickbacks” and other incentives to doctors that recommend the use of Infuse Bone Graft in unapproved situations. 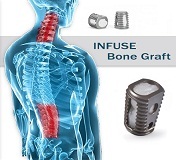 It is estimated that an astounding 85% of Infuse bone graft surgeries are considered off-label. According to Medtronic statistics, Infuse has been used in more than 500,000 patients. That equates to 425,000 off-label uses. That is huge, just plain huge. If you or a loved one has experienced any of these issues or others after a Medtronic Bone Graft, contact us to discuss your concerns at 1.800.553.8082 or online, here.